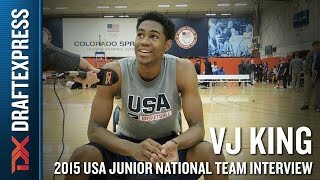 A video interview with highly regarded wing prospect V.J. King (committed to Louisville) at the USA Basketball Junior National Team Mini-Camp in Colorado Springs. -V.J. King Scouting Report, Measurements and More. King put together a solid camp from a production standpoint, averaging 20.9 points and 10.2 rebounds per 40 minutes pace adjusted, although he struggled to produce efficiently (44% from two, 11% from three). From a physical standpoint, King is an elite wing prospect. At 6' 7 he possesses an outstanding, developed frame, long arms and tremendous fluidity and agility that allow him to change speeds and direction with ease. King is more fluid than he is explosive, but he's a smooth ball handler for his position, which when combined with his fluidity, could help him develop into a big two-guard in the future. The Akron native does a handful of things well  he can handle, finish with either hand, distribute, rebound and defend. But with that said, King is somewhat of a jack of all trades master of none type. He's best with the ball in his hands and has yet to show any consistency as an outside shooter, which limits his 3 and D, role-player potential. King doesn't have terrible mechanics on his jumper, but he tends to settle for long, contested twos and off-balance threes, both habits that clearly hurt his percentages. Despite his shooting struggles and inefficient play, there's a lot to like about King as a prospect both from a physical and skill set standpoint. If he's able to continue to fine-tune his shooting stroke and pick his spots a little better, King could end up being one of the best wing prospects to play at the 2015 Nike Global Challenge. New Virginia resident V.J. King measured 6'5 without shoes, but his 7'0 wingspan was among the top marks among wings.